My husband was getting jealous of the blog. If you've been reading, you know that for the past six or seven years he's been doing most of the cooking and now that I'm getting interested in cooking again, he's feeling left out. All the recipes and photos so far have been for my stuff. I mean, it is my blog. So, last night he said he was making cookies and wanted me to photograph them and post them. Uh ... that depends, I said. I'm not photographing lumpy, bumpy all-different-sized cookies. There are rules here. They have to be easy to make, delicious and THEY HAVE TO LOOK GOOD. With a huff, he went into the kitchen. I was called in a short while later with a frenzied, "We don't have any maple syrup!" He was in the middle of putting ingredients into a large bowl. "Use Sucanot, I said." The next time I was called into the kitchen, he was arranging a batch of beautiful cookies on a plate, and I went to get the camera. They were delicious, too! 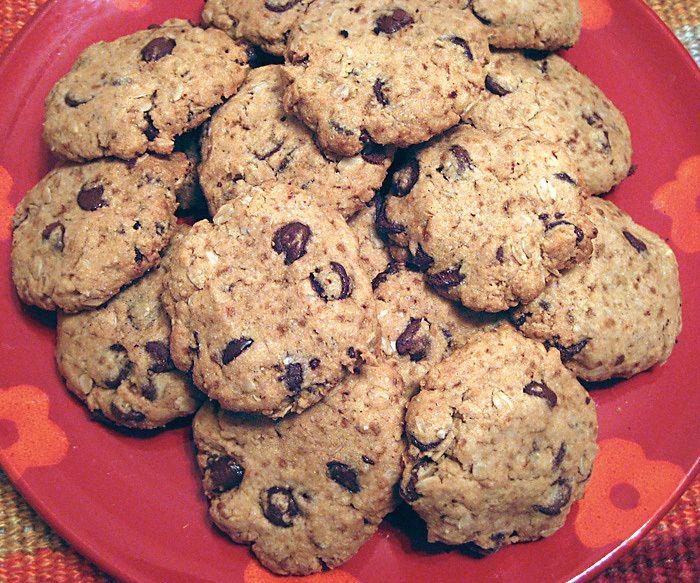 The original recipe for these cookies can be found in "Complete Vegetarian Kitchen" by Lorna Sass. We've altered the recipe a little to suit our personal tastes. -Combine flour, oatmeal, Sucanot, salt and baking soda in large bowl. Stir in chips. -Mix oil, vanilla and 2 tablespoons water in glass measuring cup. -Stir the wet into the dry until flour is absorbed. Batter will be thick but if it's too stiff to work with, add more water, 1 tablespoon at a time. -Drop by heaping teaspoons about one inch apart onto two oiled cookie sheets. Flatten and shape with your fingers to about 1/4 inch thick. -Bake on center shelf of preheated 375˚ oven until lightly browned on the bottom, about 17 minutes. -Transfer cookies to a rack to cool. -These cookies freeze very well. They even taste good frozen! note: I know these delicious cookies are fast and easy to make because my husband made them. I know they're probably foolproof for the same reason. Here's an example of what I mean. A couple of months ago he made me a frosted birthday cake. It looked amazing but there were problems. For one thing, he made two layers but didn't put frosting between them so when the cake was cut into pieces, (sawed into pieces would probably be more accurate) the two layers popped apart like a weird hinged thing held together by an outer edge of rubberized frosting. The cake was basically inedible. Although I ate my piece, my husband and son refused to eat theirs. The cake came to a good end, however. My husband added it to the compost to enrich the soil for next year's garden! Thanks for the recipe - I'll try it! Where's the picture? Thanks for alerting me to the missing picture. I've been having a little problem with disappearing pictures that I'm trying to stay on top of. Hopefully the photo will stay in place now! These sound great, and relatively healthy with whole wheat flour and such, too. There's nothing a chocolate chip cookie can't solve, so thanks for sharing! Hey Andrea - It's Katie from Madison. I am having friends over for dinner tomorrow night (making the sweet chili lime tofu!) and I wanted to make a dessert with pumpkin. Any ideas?